A new School of Engineering website has launched at the University of San Diego, aiming to deliver information to prospective undergraduate students of the school. 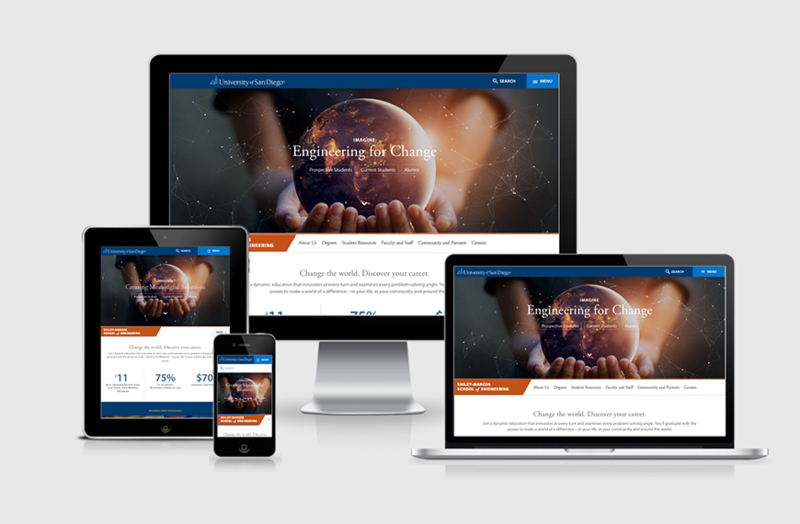 In order to create this new site, the engineering project team talked with our prospective audience as well as engineering academic and administrative leaders to gage goals and needs for their website moving forward. This is a standard element in USD's website redesign process, as websites must be relevant, timely, and useable for its prospective students in order to attract the high-quality applicants that the university is seeking. An engaging interactive hero area on the engineering home page, which website visitors can click and use to create particles--fitting considering the website's topic. Improved audience pages for our prospective and current students as well as alumni to learn about school news, events, or programs in a more personalized way. A faculty and staff directory with filtering, search, research information, and new headshots for learning about the award-winning faculty at the university. An integrated faculty scholarship system, recapping the hundreds of journals, presentations, and other scholarly forms of work that the prestigious engineering faculty lead and participate in. An integrated study abroad system which highlights opportunities for students based on world region, country, term, or engineering discipline. The information provided comes directly from StudioAbroad which contains all of the study abroad opportunities available to students at the university. A new student projects system, showcasing the Capstone projects that senior students in engineering lead from concept to completion. A new database-driven student organization finder which allows prospective and current students to see an overview of engineering-related networks, clubs, and organizations that they can join as part of the USD community. A new News Center, Event Calendar, and Featured Spotlights, all sharing information about the school, its faculty and staff, and related centers and institutes. This follows the same format as the university's News Center while highlighting engineering-specific information. Newly written and edited content throughout the website, which guided the architecture and the design process for the new site. The information architecture is strategically organized, and content was mindfully raised from the department and center level in the previous website to the school level on the new website, alleviating the need for students to track information in multiple places to find what they are looking for. From a content provider and maintainer standpoint the site remains housed within the university’s CMS solution (Cascade Server) and now utilizes the modular functionality that the USD website is based on. This will make adding features such as accordions, icons, and imagery in a grid-layout much more efficient future forward than the former maintenance experience allowed. The launch of the engineering website not only provides a new and improved experience for USD's students, but also signals the end of USD's 1.0 website redesign efforts. Stay tuned for USD 2.0, which commences in the spring and paves the way for exciting new technological, functional, and creative considerations for the USD website.